I thought that after Sunderland last Sunday, my season was over. But Anwar contacted me in the week, asking if I wanted to go to the Europa League game between Port Talbot and Bala. After some thought, I was up for it and decided to go, planning to park up somewhere between the ground and town and go into the town beforehand. I had been planning to do a game with a Welsh team in Europe in the summer, and with nothing else to do, this would be a good taster. I listened to Swansea Sound on the Friday night, and had my tweet read out too. I was also chatting to a Port Talbot fan on Facebook, and was planning a meet at the game. I had been planning not to drink much that night, but got on the rum and had a good evening talking to mates. On the day, I left on time, but had to stop for fuel, meaning that I was a bit late picking up Anwar, albeit by only 10 minutes. We left at 9.40 and went up via Gloucester and Lydney, so as to avoid the expensive Severn Bridge toll. Arriving at 1.10PM, I decided to go straight into town so as to save time. Luckily, there was free street parking. I was looking forward to going to going to Cash Generator to see if there were any retro games worth picking up. There was nothing I fancied, but I did at least pick up a few bits from 99p stores and some lovely Welsh cider from Tesco. Sadly, the same couldn't be said of Wetherspoons, who despite being billed as having some, didn't have any in. I decided to get on my way at that point, stopping first at Afan Lido's ground to get pictures. The ground is only 750 yards from Port Talbot's ground and is pretty decent for Welsh Premier League level. We got to the ground at 2.20 and were disappointed to see that programmes had already sold out. On the upside it was only a fiver to get in. First thing I did was to go into the club shop and get a pennant for £3 After taking some pictures of the ground, I went in the bar and got a pint of pear Magners and some chips, which were the cheapest portion I have had this season at only 80p. A lot of Swansea fans were there too, seeing as it is only 10 miles away. Both they and the Port Talbot fans were really friendly and made us feel very welcome. Especially the Port Talbot Ultras who invited us to join them for the game and who gave their side great support throughout the game, some of the best support I have seen this season. The game was worth £100k to the winners, which is a hell of a lot of money for a league where most clubs attendances are rarely above the low hundreds. This was reflected in the game, which was a tense, cautious affair although Port Talbot had the better of the opening exchanges and hit the bar early on. Bala had won 12 games in a row coming into this and although it didn't show early on, they came more and more into the game as the half wore on. But it was goalless at the break, and the second half looked unlikely to separate the sides, despite chances at both ends. Port Talbot had strong claims for a penalty when Cortez Belle was felled in the box when clean through. He had won every other challenge that afternoon and had a good chance to score, so it looked like the inconsistent referee had got it wrong. And from that chance, Bala broke away up the field and despite 3 great reflex saves from the home keeper, John Irving broke the home side's hearts with a clinical finish into the corner. I was rooting for Port Talbot at this point and so was really disappointed for them, especially as I was looking forward to some extra time and possibly penalties. The final few minutes ebbed away without muxh happening and so it was Bala who progressed to the Europa League. I went on the pitch at the end, welcomed by the stewards, which was nice. Who knows, I may go to Bala to see their European game, I certainly want to see more of Wales. We left around 5.30 and after dropping Anwar off at 8, I was back home by 8.20. So this was my first Welsh Premier League ground, and I had certainly enjoyed it. The Welsh channel, S4C, certainly do a huge amount, having their highlights show "Sgorio" (scoring in English) Despite the show being in one of the most difficult languages to learn in Welsh, I have still seen it on a few occasions. A mixture of great goals and horrendous mistakes, featuring a fat Bangor keeper (sometimes) and a tendency to have grounds with lots of unused seats and cars parked at the side of the pitch. And they even do a number of live games too, including the one I was at. Despite this coverage, people are still staying at home or sticking to rugby, especially as there is no competition from English sides for the likes of Aberystwyth and Bala, with attendances 500 at the most. Perhaps an idea would be to have the league played over the summer, with the mid season break at the start of the year. Certainly a lot of Swansea fans would support Port Talbot when they have no game, and it would put them in good stead for the Champions League and Europa League games which are in early July, currently they don't even have much of a pre season to prepare for these. THE GENQUIP STADIUM is a decent ground for this level, having seated stands on both sides of the pitch, with grass banks at either end. Behind one end, you get lovely views of the Welsh Valleys. Even with their biggest attendance of the season, there was more than enough space for everyone. 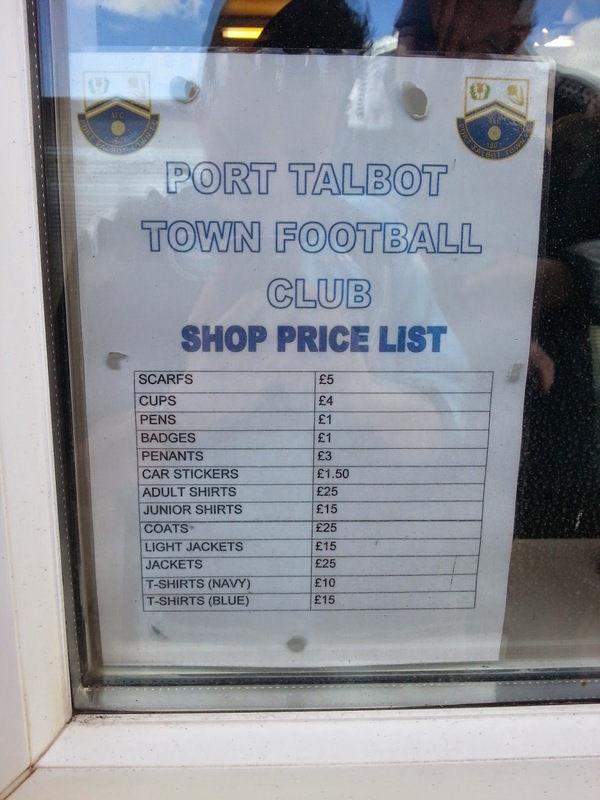 The club shop is decent, offering good value and a selection of old programmes. The tea bar as well is good value, and the bar has a wide selection, even if it didn't do the Welsh cider that I like, which would be simple to stock as it is in bottles.